However, you may find yourself laughing with abandon before you finish this little practice. 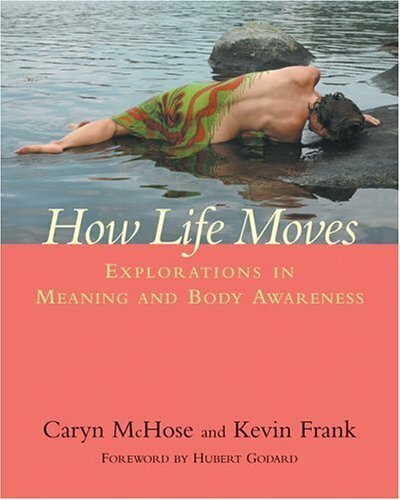 Caryn McHose and Kevin Frank have written a delightful book called, How Life Moves, Explorations in Meaning and Body Awareness. The book literally fell off my shelf today as I was sorting through books I want to keep in my move to Austin, and those that I will be gifting away. Let’s just say that I will be keeping this one! Directions follow which come straight from the book. This practice is the invention of Emilie Conrad, the founder of Continuum. Personally I suggest that if you have a physioball, use it (bouncing is absolutely delicious! 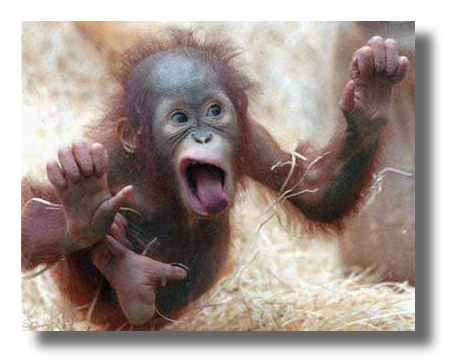 ), as it creates another element to freeing your body and breath into movement freedom and instant laughter! Breathing Spaces are only limited if you inhibit them….so I say go for it today and try on something completely different. (even though I suspect that for some of you this will be just normal everyday behavior!) Enjoy and let me know how you feel!! As I write this 1,000’s of feet up in the air in a plane, taking a deep breath seems to take on a very different set of life skills. Why is that? Recycled air, crunched seating with one’s body confined to a very small area of moving room, cabin pressure, and oh those little tiny bathrooms that when toilets are flushed you wonder if you just might be sucked down and out into the wild blue yonder! This post is dedicated to the deep diaphragmatic breath. I call it the breath of flight, not only because I am writing this confined to that little tiny seat and breathing recycled air, but because I believe that this breath assists us to take flight in our lives. Used in many different situations, this deep breath marks moments when we are reminded that we are indeed biological creatures that need air to function. Often we find ourselves taking a deep breath because all of a sudden we realize that we have not been breathing at all…or I guess I should say very shallowly. For periods of time when focused on something outside of our bodies – which is often by the way – we hold our breath. How in the world can we remain more conscious to breathe fully with all of our primary breathing muscles instead of secondary ones? Most people use secondary breath muscles which are the muscles of the front of the neck, pectoralis muscles in the chest, sternocleidomastoid, and the upper trapezius. 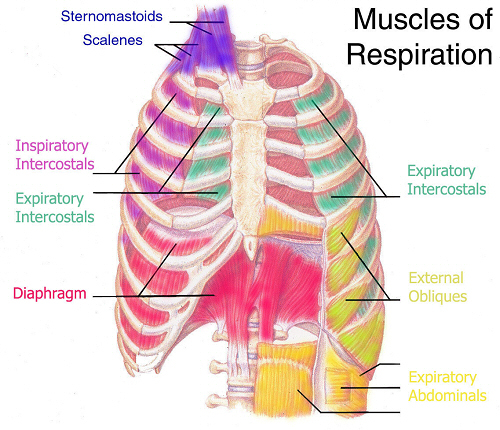 What are not used as often are the primary muscles of breathing which include the diaphragm, intercostal (between the ribs) and the abdominal muscles that are meant to give us that full-bodied breathing experience that our bodies innately crave. Awareness is the key here. What if we took Breath Awareness Breaks (BAB’s for short) instead of coffee breaks? Might we feel more enlivened, relaxed, peaceful, focused and creative? The daily practice of rhythmic (wave-like) diaphragmatic breathing with gradual and equal prolongation of the inhalation and exhalation will enhance the body’s ability to experience a sense of deep relaxation and rest, free of stress and strain, and with a marked feeling of calm and peace. *Place your hands on your legs palm side down, if you are seated. If lying down rest your hands on your belly to encourage the inhale to expand there first. *Take 3 deep breaths with mouth slightly open and relax – feeling the stress exit your body and the toxic mental chatter drain away. Let your body relax/soften into the chair, or the surface you are lying on. *Exhale completely through the nostrils releasing all of the air out and drawing the naval (belly button) down towards your spine and up under the ribs. (relaxing of diaphragm – it relaxes back up.) The wave of breath unfolds itself to the shore of the next pause. *Do this practice in a series of 7 breaths. Rest for 2 minutes while being aware of your breathing and how you feel in your body, mind and emotions. Repeat the process two more times. This breath massages all of the internal organs, encourages the movement and flow of the lymphatic and vascular systems, – and of course exercises the respiratory system which requires moment to moment workouts to keep it healthy and strong. This is especially important when we are sitting for long periods of time or inactive physically. Next time that you fly, whether in an airplane or on your next stepping off of the proverbial cliff for a life change flight, put your attention on the wave breath and see what happens. Breathing 101: We are all breathing in some fashion, even when we are not aware of our breath, but the normal patterns of breathing are usually shallow, restricted, and contain many holding patterns. These reflect deep imbalances in our systems. When our breathing patterns are weak, we may have low energy and find ourselves easily fatigued and more emotionally stressed. When our breathing patterns are deep and strong, we have increased endurance, stamina, and a sense of well-being. For further information about this 2 hour workshop, please go to the tab above and consider contacting Gaye Abbott, RYT for an experience that will unlock your potential to thrive in life through breath awareness. Many times over the last few weeks Breathing Spaces has commented on the innate truth of the deep interconnection of all life on this planet we call Earth and beyond. From sharing the air in each breath we take, to the moving wings of a butterfly felt on the other side of the world…to the upheaval that is presently shaking our Earth back into balance. Co-Creating, maintaining, and honoring all ready well established natural sustainable systems that grow and thrive in balance, harmony, and interconnectedness is perhaps at the focal point of what we as humans need to remember of what has gone before….before our narcissism put us above the life forms that sustain our very being and we fell into the illusion of being separate. We do have this innate interconnected wisdom within us. It is in our cells. This weeks post shares with you a few words taken from recent thoughts by Carolyn Myss after the most recent natural disasters. It is BreathingSpaces hope that the magic, intelligence, and mystery of our natural world, the Earth planet we live upon, be embraced with love, honoring, and gratitude….and that each person remember it is the natural order of things that brings us the very air we breathe. Could it be that as we remember to breathe naturally within the cycles and rhythms of the breath that we were given at birth – that we will be inspired to reconnect with all that gives us life and become once again the guardians of Earth….instead of the destroyers….remembering that there is an intelligence that resides in every single living thing. and we are deeply and irrevocably connected. ……“We are now living at a time when all cycles and systems of life are out of balance, including our system of perception itself. We do not “perceive” life clearly at all and thus, we as a society make choices that are based on endless illusions. And illusions lead to disasters. There was a time not so long ago, for example, when human beings walked more humbly on the Earth and under the Sun, the Moon, and the stars. Before the “Age of Reason,” a person walked into a forest filled with the awareness that the forest was as aware of him as he was of it. He shared the ground with the forest and all the creatures who lived there. They were not his for the taking, for the slaughtering, for dominating. In times gone by, people lived in a type of consciousness in which even the slightest movement of the wind meant something – perhaps heaven was piercing the veil between dimensions, speaking in a soft breeze, moving a branch or a leaf in order to communicate a message, or a warning, or signal its approval. The stars that filled the sky at night were not just pretty, shining objects, but proof of a celestial homeland, the blanket of the Divine covering humanity. Every living creature had purpose and meaning, a place in which it was given a natural dignity because it was created by a God no one doubted existed. Of course human beings were still human beings in those days before the Age of Reason introduced a love of logic and a God who (obviously) had scientific reasons up “his” celestial sleeve for why all things happen as they do in this whole big universe. Civilization was also a dark and dreary place back then, with disease and the plague, and endless wars … Oh wait, am I describing then or now? Oh, I’m describing their version of then, not ours. Though they also had war, and they also had epidemics, and they also had starvation, what they did not have that has driven our civilization to the brink of madness is an epidemic of narcissism blended with an epidemic of blind doubt about the existence of the cosmic structure that holds together this fragile place called Earth. Back then, no one doubted the existence of this invisible reality. Today, that doubt is an epidemic and the absence of respect and reverence for the Earth is reflected in the choices governments and corporations make as well as individuals. Is Mother Earth angry? Don’t be silly. A cosmic force hardly gets angry. But a cosmic force is seeking balance, just as your individual body seeks balance when it has been struck with a toxin. What is the difference? The Earth will continue to have an increase in earthquakes, tsunamis, floods, droughts, and whatever else is required to reestablish balance in Her environment. She is a living organism that is, in effect, rebooting Herself. Only the human community has the idea that we somehow live apart from the Earth, that the Earth does not respond to our breathing, to our thoughts, to our actions. It’s incomprehensible, to be sure, to even hold such a perspective. But the Earth is that sensitive. Recycling, I assure you, is not enough. 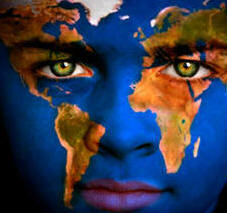 Consider the Earth as a family member instead, as a Being that sees you as clearly as you see it. And you are on the “Earth” as much when you are standing in the midst of New York City or London as you are in the middle of a forest. You are still “on the Earth”. Standing on concrete or in a building does not make it any less “Earth” except if you hold to the perception that what qualifies for the “Earth” is out of the city in green or desert nature. But that’s an illusion. How can you ever be off or away from the “Earth”? It’s precisely that perception – that Nature is in the country but not in the city – that maintains the illusion of separateness. You may prefer to be in the country but you always are on the Earth.” ……. 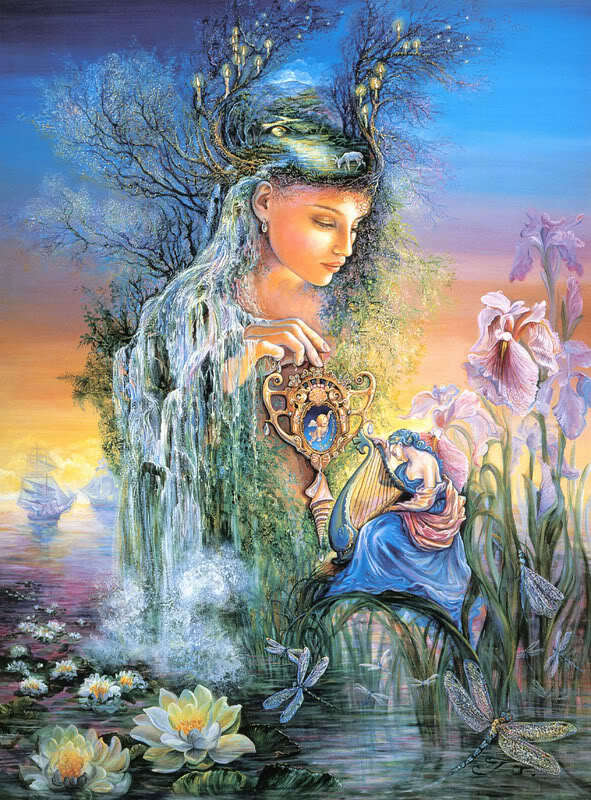 Come back to the remembering of a world where all was intimately interconnected with the natural world, and magic prevailed throughout the land. 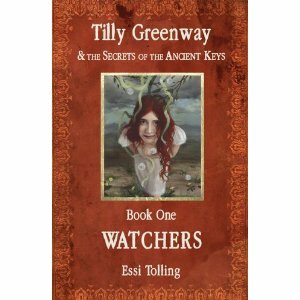 Travel with 12 year old Tilly and 13 year old Zack in an adventure of a life time – an adventure that reminds us of who we are and how far away from that we have fallen to. You won’t be able to put it down…I couldn’t! Years of “meditation”, formal and informal, have taught me that fully being present to life moments is truly the “meditation” that will change not only our individual lives, but all that we touch and beyond. This practice of awareness has the potential to open possibilities for free creative expression, connection, and collaboration in all the varied forms that it takes. As we pay particular attention to the feelings that are informing our hearts, the electromagnetic currents radiate out and energetically connect all over the world. Global shift and transformation come from this – this deep interconnection with all of life. What we do individually really does matter. The power that we hold collectively is beyond measure. It is not only being felt more strongly now, but more of us are coming together to create change in alignment with the health of the planet and well being of all living creatures. There is no separation. Praying for the water that has been contaminated by radioactivity, joining 1,000‘s of others meditating for peace and non-violence, breathing together as one on behalf of those that have been affected by disaster…..there is no action that is taken, nor event that transpires, that is not felt by all. As we breathe fully we are able to inhabit our lives with awareness – to break the structures of our lives that have kept us imprisoned. As we breathe fully we can feel fully….and no matter what those feelings are, or how difficult they may be, they are shared by many. You are not alone…no never alone. Even physiologically each of us reduce our hearts work when we breathe fully and naturally. This produces a stronger and more efficient heart that not only works better, but also lasts longer. It reduces the cardiac rhythm, and at the same time our nervous system is relaxed, helping us to feel better, with more energy and an increase in tranquility….which of course is transmitted to the life around us. We have a choice. First open your heart to yourself and in this moment breathe through your heart. Soften your belly – allow the guarding and protection to melt away. 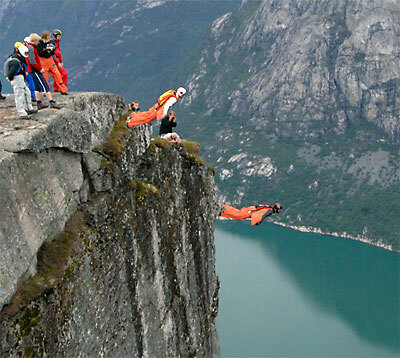 Just for this moment….and the next….and the next…..and the next. Breathe through your heart.